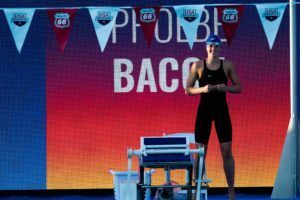 16-year-old Phoebe Bacon moved up to #8 all-time in the U.S. 15-16 age group, putting up a 1:51.79 in the 200 back. She’s liable to move up a little more tonight, just .05 behind Meghan Small for 7th, though the NAG record is way down at 1:48.30 from Regan Smith. Fellow 16-year-old Isabelle Stadden was second in 1:53.39. Stadden is #2 all-time in the age group with a lifetime-best of 1:50.37 from last winter – she should have a solid race with Bacon tonight, and will aim to become just the second 15-16 ever under 1:50. Nation’s Capital’s Caroline Bentz sits third, with teammate Katelyn Mack eight tenths back. One age group down, watch out for Nova’s Zoe Dixon, who went 1:58.13 this morning. The 14-year-old moves to 64th all-time in the 13-14 age group with her prelims drop of a second. 18-year-old James Marcum of McCallie Aquatics went 1:43.51, blowing away his seed time by two and a half seconds to take the top qualifying spot. Prior to today, Marcum had never been under 1:46. That swim moves him into the top 100 all-time in the event among U.S. 17-18s. Two more should challenge him tonight if they can return to their seed times. Jack Dolan was 1:44.01 this morning, but was 1:43.4 at this meet last year. Sean Conway went 1:44.18 this morning, and he’s been 1:43.5. That could set up an outstanding race between three of the better high school seniors in the nation. Marcum is committed to Indiana, Dolan to Arizona State and Conway to Virginia. Lexington Dolphin Zach Hils was fourth, and the entire A final is made up of 18-year-olds, in contrast to the youthful girls final. 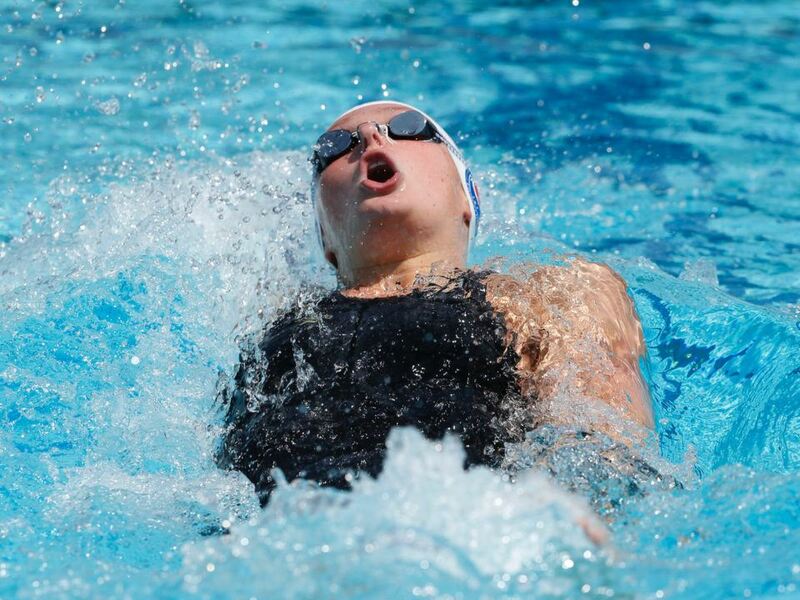 Long Island’s Chloe Stepanek cut three tenths from seed to take the top spot in the 100 free. It should be a great race tonight, with 1st through 8th separated by six tenths this morning. Delta’s Grace Cooper is second, and Christiana Regenauer third. Most of the top swimmers added a little time from seed this morning, and might be loading up for a bigger finals race. The top pre-meet seed is Torri Huske, who went 49.79 for 7th. She’s been 48.9 in her career and ranks 30th all-time in the 15-16 age group. She could break a tie with Amy Bilquist with a time drop tonight. The boys swam the 500 free instead of the 100 this morning. Luke Maurer of Wildcat is the top qualifier at 4:21.50, a huge drop of five seconds from seed this morning. Unattached Jacob Rosner had a nice drop of his own, taking about a second from his seed to go 4:23.44. Andrew Matejka of Gator Swim Club went 4:24.00 in taking third. 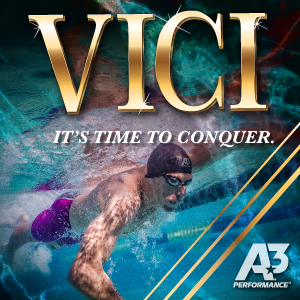 Tonight, keep an eye on 1000 free winner Ryan Vipavetz, who was two seconds off his best time this morning in 4:24.65. 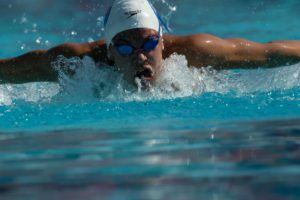 Cleveland Swim Institute’s Hannah Bach is the top 100 breast qualifier. Bach was 59.29 at Ohio’s state championships last month, but cruised to a 1:00.39 this morning. The current high school senior and future Ohio State Buckeye is 15th all-time in the 17-18 age group and will shoot to become the 11th under 59 tonight. Machine’s Anna Keating went 1:00.45. She, too, has been sub-minute, but wasn’t under the barrier this morning. Her lifetime-best is 8th all-time among 15-16s, and within striking distance of #6. Baylor’s Cecilia Porter had a half-second time drop from seed to take third. 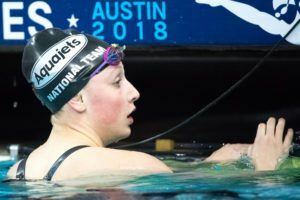 At the back of the A final, keep an eye on 14-year-old Kaelyn Gridley, who sits 16th all-time among 13-14s and was three tenths off her best this morning. 16-year-old Anthony Grimm of the Mason Makos has blown up the past few months, and this morning he showed some impressive versatility. 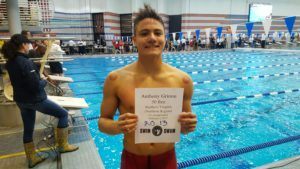 Known more for his standout backstrokes at Virginia’s high school state meet, Grimm went 53.42 to lead the 100 breast this morning. That’s a drop of eight tenths from his best and moves him from #19 all-time to #9 all-time among U.S. 15-16s. The NAG record is a fast 51.7 from Michael Andrew, but only five 15-16 boys have been under 53, which Grimm could do tonight. One of the five, though, is right next to him. Joshua Matheny of Team Pittsburgh Elite went 53.68 this morning for the second seed. Matheny was 52.89 back in December, so he should give Grimm a good run tonight. Matheny ranks #5 all-time in the age group’s history, and could pass Carsten Vissering with a drop of .06 tonight. St. Charles’ William Myhre is third (53.84) and Jason Louser of Long Island (54.05) fourth. Myhre was 52.5 in December and could top both Grimm and Matheny tonight with a good swim. Myhre ranks 13th all-time among 17-18s. NOVA of Virginia took the top spot this morning wiht Grace Sheble‘s 1:55.93. Sheble has been as fast as 1:55.82 last year at this meet, and will look to crack the top 20 15-16s in history tonight. She needs a 1:55.7 or better to do so. 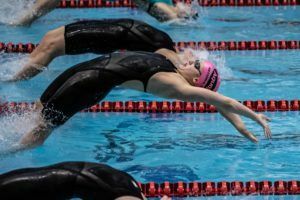 Abigail Harter was second for Nation’s Capital, a few hundredths back from her seed, which ranks 27th all-time among 17-18s. 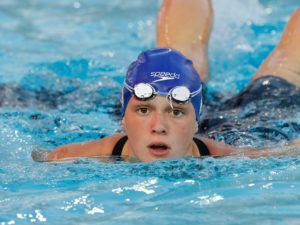 And the top 13-14 swimmer is third: Tess Howley out of Long Island Aquatic Club. The 14-year-old Howley dropped six tenths to go 1:56.12 this morning, .01 back of Harter. Howley moves from 10th to 6th all-time among 13-14s, and his within a half-second of Claire Curzan’s NAG record 1:55.64. 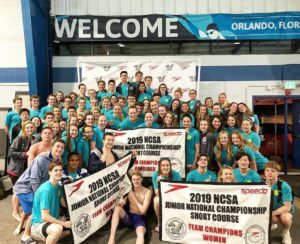 Over the past four months, we’ve seen three different girls become the first U.S. 13-14s ever to break 1:56 (Curzan, Charlotte Hook, Lucy Bell) and we could see Howley become the fourth tonight. Rockville Montgomery’s Alexander Colson leads the boys 200 fly in 1:45.53. That was a drop of just over a second this morning. 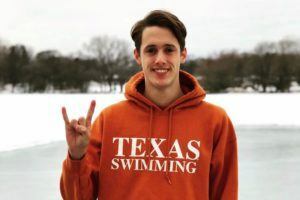 The 18-year-old moves just inside the top 100 in age group history with that swim. Long Island’s Timothy Marski is second in 1:47.04. He’s been 1:46 before, but will need a drop to challenge Colson. Meanwhile Ryan Vipavetz came off the 500 to make his second A final, and Jason Louser came off the 100 breast to drop two and a half seconds from seed, going 1:47.90. Most of the early heats of the 200 medley relays went off this morning, but the fastest two heats will swim with the finals session. Current results are not yet available on Meet Mobile. 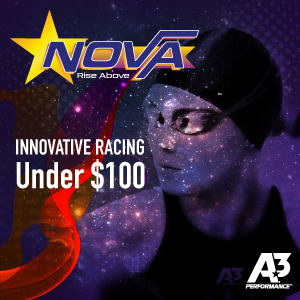 Grace Sheble swims for NOVA, not NCAP. Maybe the announcer could pronounce Grace Sheble’s name correctly tonight? (the “e” at the end is not silent). There’s a whole lot of kids with very unique names. Anyone who takes on the role of an announcer is impressive to me. Wow, in all the years I’ve been watching swim meets, that might be the first time I’ve ever heard of an announcer mispronouncing a kid’s name. Way to go Luke! Your PASA family is cheering you on. Good luck tonight!